It is hard to believe that ten years have passed since we evolved from a VQA wine store to a full service liquor outlet. In that time, the local craft beer industry has exploded, and we subsequently started offering Beer Mail so people could take advantage of our unique selection without driving to Fairfield. It is long overdue for us to finally launch the same service with wine. It makes sense, since our approach to the wines we carry is similar to our craft beer program: we handpick everything that’s in the store. There is a sea of product out there, and we navigate through it looking for tasty value wines from smaller producers. 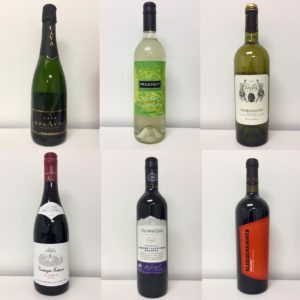 Perceived value can be at any price point, so we categorize our wine selection into three distinct groups: Value Wines Under $20, Good Examples of Region or Variety between $20 and $50 and Wines of Stature $50+ (which we have stashed in our vault, where our staff can personally show you). So whether you want to spend $12 or $1200, we have a wine for you in the carefully curated groups/categories mentioned above. Our inaugural Wine Mail offering represents the Value Wines Under $20 category and features some solid buys. Browse the descriptions below and then head to bottom of this post for ordering details. What a buy for delicious bubbly! This Spanish cava features ripe fruit, creamy mousse and a dry finish. For years I’ve maintained that Prospect is consistently the best domestic value. Lemon pie with a zippy ending! A true gem from a small producer in the Languedoc region. Peachy, lemon, hints of spice; round and flavorful. My personal house wine. Blackberry, currant and spice flavours that are luscious and savory. All day, every day! High altitude organic farming delivers a wine bursting with juicy berry and plum flavours. This wine’s wholesale was $20+, but the supplier is blowing it out. Big bold and rich. Drink it until gone. We’re offering this hand-picked selection of six bottles for only $102, or get two bottles of each for a total of 12 bottles for just $185.20, delivered to your door in the Victoria area. Delivery is FREE in the Greater Victoria Area! To place an order*, please call at 250.995.2665 or email info [at] cookstliquor [dot] com during our regular business hours, 10 am to 10 pm, 7 days a week. *Disclaimer: Purchaser must be of legal drinking age and provide two pieces of ID upon delivery. This offer is subject to availability and delivery schedule—24 hour notice required, and no delivery on Sunday.